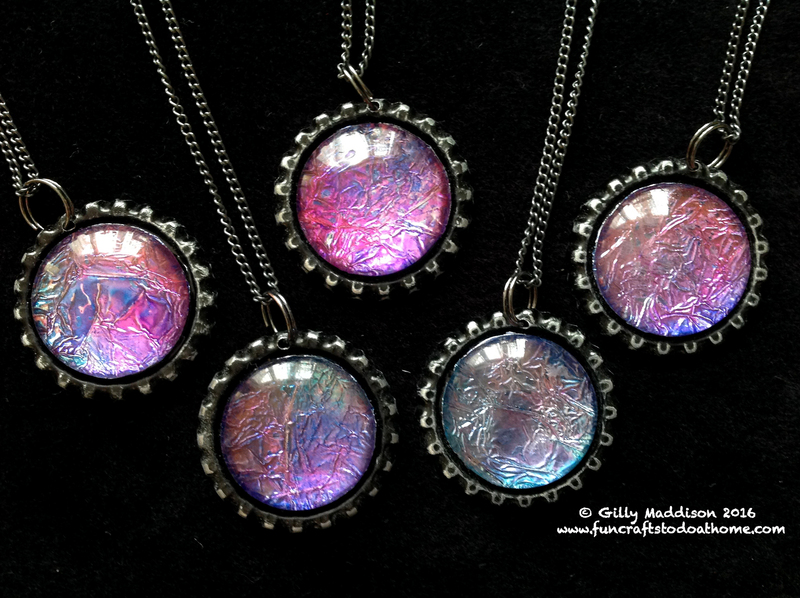 Make beautiful 'Moon Glow' alcohol ink pendants using kitchen tin foil. Alcohol ink pendants are my latest arty happening! After seeing someone online doing crafty things with ordinary tin foil, I thought it would be fun to try and make some jewellery using that technique. My previous post was also about using alcohol inks - you can find it by clicking here. I have been making bottle cap necklaces for years and so I was inspired to use the bottle caps I have in my stash of resources to create some alcohol ink pendants. To help you create your own alcohol ink pendants, I have made a YouTube video. A link to the video can be found below. I have also added some Amazon links further down, for some of the resources I used in the video. I do get a very teeny commission if people buy from Amazon, however, there is nothing promoted on this blog that I have not used myself and can genuinely recommend. Below are the alcohol inks I used to tint the foil for the pendants. Keep on Crafting has a brilliant range of colours in stock; if you live near enough to the shop to visit in person, I would recommend going along to look at what owner Mandy Shedden has on the shelf. I also got the alcohol blending solution and the Diamond Glaze from Keep On Crafting. I have been using Diamond Glaze to attach the glass overlays to my bottle cap pendants for years. After trying many other glues, I found Diamond Glaze is the one that works the best for me. These inks are available from www.keeponcrafting.co.uk in Bury St Edmunds Suffolk. easily punch a 1.8mm hole in your bottle caps. have pierced hundreds of bottle caps. Glass domes are available online. Have you used alcohol inks? We at funcraftstodoathome.com would love to know how you use yours so leave a comment and let us know. If you would like your craft work featured on this blog, get in touch with us. These alcohol ink pendants are another adventure in my arty explorations - I am sure there will be more soon! Previous Previous post: Alcohol Inks – Oh My Word! I love all 3 on the top row. I’m still amazed at all you craftiness-ness!! Thank you for your lovely comments – I really appreciate your time in visiting and commenting!